Card games are a fantastic form of entertainment. They work anywhere and everywhere, they’re small enough to fit into a bag for travel, and there are many different kinds of card games out there. If you like to test your luck and skills with a fun and exciting card game in Vegas style that can be hard to find among so many of these games offered. Luckily for you, we searched and found one amazing casino card game that will get you hooked to playing fast. Let’s see what the game offers you. For all lovers of casino games, this incredibly fun and exciting Vegas-style casino card game will get you addicted to playing fast. The game is easy to play and yet will challenge you while you enjoy the clean and crisp card design and screen layout that make the game even more interesting. Developed on the android platform, the game can be played against others or as solitaire. All you need to do is to combine cards that equal 12 to clear the center stacks. Practice with help of the short tutorial at the game’s start. 4KingRoyale offers incredible gameplay and various features that will hook you to the game while helping you learn the basics and practice with the interactive tutorials offered. Practice to play better and reach the Hall of Fame as one of the best card players. Played with a standard 52 card deck, with or without Jokers and to win the player needs to eliminate all the card on the playing table or for an even bigger pay-out to leave only the Jokers or the Kings. To do this you need to combine the cards which equal 12 but in the same time, you need to beware of the King as he can be your best friend and help you win big or he can force you to lose by blocking you. Just tap or drag cards to play and stay on track of your play with the statistics available. Hints are available to help you when you get stuck. 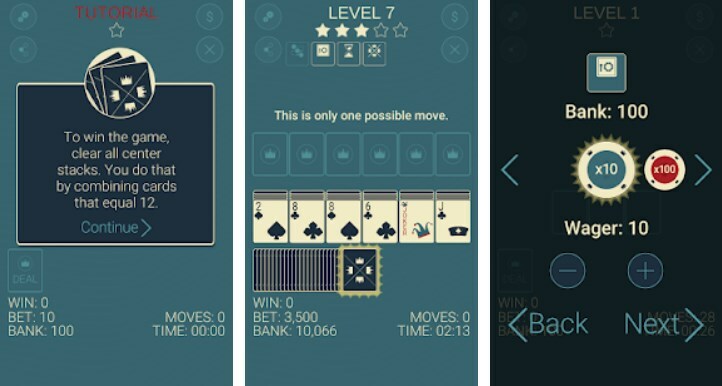 Play unlimitedly for free and choose to compete against players or as solitaire. Invite friends to join you, try the portrait play and try to get higher on the leader-board and the achievement board. Practice and play to qualify for the inaugural World Series of 4 King Royale. Download this game for free now on Google Play to test your skills and enjoy the Vegas-style card gameplay!